The stable weather across the region should stick around for another few days, but temperatures will warm significantly over the next few days. A low pressure center which passed through the Pacific Northwest will move to the east allowing a slow buildup of a ridge of high pressure onto the Pacific coast. The ridge will strengthen so that by Wednesday high temperatures will hit the mid-90s, and we could see triple digits by Thursday. All that heat will bring a chance of afternoon thunderstorms back into the picture by Friday through the weekend. 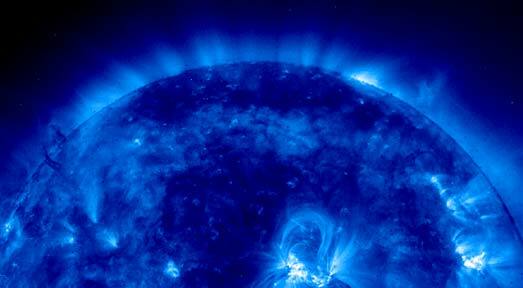 An ultra voilet image shows UV rays from the sun as deep violet in color. Kids: By the time children turn 18, they will have already been exposed to 25% of their lifetime UV exposure, so it’s critical to push sunscreen habits on them early. Gardeners: They spend an average of 2.8 hours per week out in the sun. It may look goofy, but a wide-brimmed hat should be part of the uniform. Seniors: Their skin cells are less able to repair damage from the sun, and there’s evidence that UV increases cases of cataracts. Wear sunglasses!